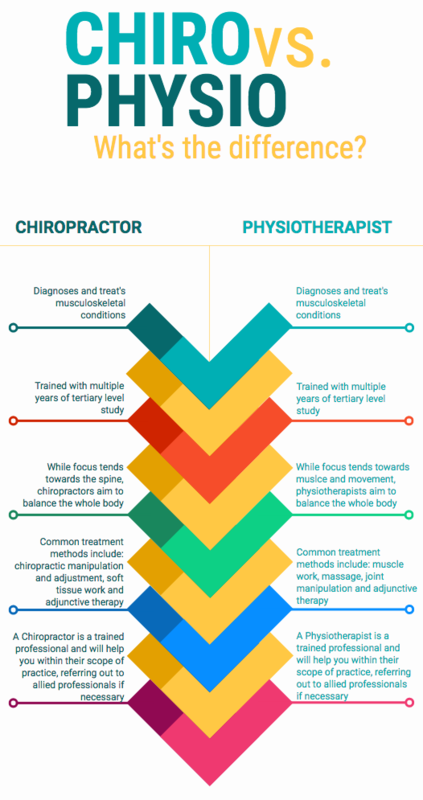 What’s the difference between a Chiropractor and a Physiotherapist? Probably the most common question posed to any of our staff in the clinic (after asking about our opening hours!) is time and time again the same. Often patients expect that Chiropractors and Physiotherapists are like two boxers in the ring however, it’s far from the truth. Both professions regularly seeking the assistance of the other for our patient needs. While ActiveLife Chiropractic may be slightly bias as practitioners of Chiropractic ourselves – you will soon see the crossover between the two professions. Many times people in discomfort or pain are faced with the decision of seeking care from a professional and are, often at times unsure which specialist to approach, Chiro Physio? The short answer to the question is that, while the two professions are very different, there is some overlap too! Chiro vs. Physio – What’s the difference? As you can see that while the two professions are similar, there are some differences and this primarily lays in the philosophy underpinning each profession. Physiotherapists and Chiropractors alike focus on treating patients through a hands on approach. Chiropractors primarily focus on the use of a technique known as an adjustment to help create bio-mechanical correction. A Chiropractor focuses, not only on the alignment of the spine, but also on the healthy function of the entire nervous system, protected by the spinal column. Chiropractic is not however, limited only to the spine and the goal of any Chiropractor for their patient should be to improve their well-being as a whole. Physiotherapists; while some are trained in the practice of manipulation, tend towards a broad scope of practice. A primary focus on recovery of function (such as post acute injury). Physiotherapists excel in the field of soft-tissue problems and injuries, and often when presented in the ActiveLife Clinics we will refer these cases out to our allied colleagues. Regardless of your decision, it’s important to remember that both Chiropractors and Physiotherapists are trained health care professionals. Both are highly skilled in their individual areas of expertise to assist the body to do what it does best, that is – heal itself. Certain conditions will warrant using one technique over another however, it’s important to remember that both skills of practice are not mutually exclusive. If you are unsure of which professional to approach, choose the one you feel most comfortable with. A skilled and trusted allied health care provider will give you the honest truth to help you on the road to recovery.